We have centuries of Agricultural history. Our Ag ranges from large-scale row-cropping, ranching, pecan and citrus orchards, silva-culture, dairies and nurseries to niche market, specialty finished meats, vineyards, organic produce and honey. Ag support services and infrastructure businesses can be found within 30 minutes of downtown Monticello as well as all of north Florida and south Georgia. The county is divided into two major physiographic divisions: the Northern Highlands and the Coastal Lowlands. The two are separated by the Cody Scarp, Florida’s ancient shoreline. The Highlands are ideal for crop and livestock farming, while the Lowlands are prime for timber production. For more information about our ecological communities, soils, ground and surface water and climate, visit Jefferson County’s Natural Environmental Resources page. For more information on the Commercial Agricultural Classification, visit the Property Appraiser’s Office website. We can help you locate an optimal site. After locating the right property, east of the Aucilla River, rancher John Todd of Madison Oaks Farm began clearing the land and purchasing cattle. 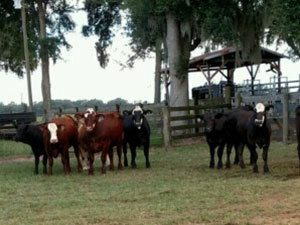 The farm is raising grass-fed and grass-finished beef cattle for processing, inventory and marketing. They employ a regular crew of local laborers, with more hands hired on as needed.